Humans are the most advanced creatures of the nature. It looks like humanoid robots will be the most advanced creatures of humans. Among the man-made creatures such as automobile, hand-phones and multimedia devices, robots of the future will hopefully be the most ideal assistants to human beings. Robots can live up to this expectation because future intelligent and autonomous robots could free humans from, or ease them up of, repeatedly undertaking physically and mentally challenging routines. For instance, Robot Doctor could provide medical advices, pre-diagnostic, and even assist in surgical operation; Robot Nurse could assist patients in hospital or at home; Robot Soldier could participate in military intervention, and even fight terrorism; Robot Tutor could help our students to have a better learning experience; Robot Guard could make our society much safer; Robot Maid could keep our house clean and secure, and even help look after elderly people at home; Robot Rescuer could be deployed to places where human lives are in danger. The list of potential applications with intelligent and autonomous robots is growing. KEYWORDS: humanoid robot, ZMP, semi-inverse method, active exoskeleton, active suit, force-position control, artificial intelligence, dynamic control, decentralized control. Rapid development of humanoid robots brings about new shifts of the boundaries of Robotics as a scientific and technological discipline. New technologies of components, sensors, microcomputers, as well as new materials, have recently removed the obstacles to real-time integrated control of some very complex dynamic systems such as humanoid robots, which already today possess about sixty degrees of freedom and are updated in microseconds of controller signals. In view of the above statements, the work raises for the first time the essential question on the justifiability of increasing the number of degrees of freedom of humanoid robots, having in mind that for the overall skeletal activity man has at its disposal roughly about 700 muscles of human body which could be approximately expressed by more than 350 equivalent degrees of freedom, i.e. the same number of biological actuators. In relation to this, the work raises also some new fundamental questions concerning the necessary anthropomorphism of humanoid robots, how to define the degree of anthropomorphism, and finally, how to achieve the highest degree of anthropomorphism with a lowest number of degrees of freedom. On the example of a humanoid robot, concrete measures are proposed on how to achieve the desired degree of anthropomorphism of humanoids. The above-mentioned obstacles being taken down, along with the humanoid robots playing mainly the role of communicators and entertainers, there have appeared humanoids of quite different aspirations in the domain of manipulation-locomotion activities of humans (case of sports-man on a trampoline, man on the mobile dynamic platform, running, balanced motion on the foot - a karate kick, playing tennis, soccer or volleyball, gymnastics on the floor or by using some gymnastic apparatus, skiing - balanced – motion with sliding, etc.). There are still limited results on human-like motion, while the field of human-like communication has produced several viable alternatives. On the other hand, human-like intelligence is the main obstacle to be overcome because of its complexity and multidimensionality; it is also responsible for coordination of the entire personal robot behavior. All this have appeared as a result of the pioneering work related to the development of active exoskeletons for rehabilitation purpose. We have to note once again that first in the world active exoskeletons were developed in Belgrade at the Mihajlo Pupin Institute by the end of 60’s and beginning of 70’s of the past century. Our first public presentation of the mentioned devices at the international congress of automation in Dubrovnik in 1972 generated high interest and high approval. Numerous foreign visitors and participants congratulated us for the presentation, mentioning that they saw this for the first time. Japanese colleagues especially didn’t cloak their raptures. Further expressions of recognition arrived later in the form of written opinions of the world recognized scientists in the domain of robotics, such as Professor George Beckey  and Professor Robert McGee . Today also, about this write and speak people who are far ahead from all the others in this domain in the world, the Japanese scientists. Starting from the ‘pater’ of Japanese robotics, the late Professor Kato and ending with almost all scientists and researchers at the leading universities and companies in Japan. All of them clearly recognize our pioneering results in the domain in humanoid robotics developed in Belgrade, along with the ZMP method as a unique and basic tool for gait modeling and realization. The idea of humanoid robots has arisen from the desire to help handicapped persons, especially heavily immobile ones. First, human body most applicable models of active exoskeletons for paraplegic persons were realized in 1972 and 1974 by the researchers of the robotic Center of the Mihajlo Pupin Institute and Orthopedic Clinic in Belgrade. Especially we want to note the role of Russian scientists and experts from the Central State Institute for Orthopedic and Traumatology, who actively helped us in research and improvement of our exoskeletal systems. The word robot appeared first in 1920, in the play “Rossum's Universal Robots”, written by the Czech writer Karel Capek. The play depicts perfect workers – robots, endowed with emotions enabling to increase their productivity. Concepts akin to today's robot can be found as long ago as 450 B.C. when the Greek mathematician Tarentum  postulated a mechanical bird he called "The Pigeon" which was propelled by steam. Al-Jazari (1136-1206), a Turkish  inventor, designed and constructed automatic machines such as water clocks, kitchen appliances and musical automats powered by water. One of the first recorded designs of a humanoid robot was made by Leonardo da Vinci  in around 1495. Da Vinci's notebooks, rediscovered in the 1950s, contain detailed drawings of a mechanical knight able to sit up, wave its arms and move its head and jaw. The first known functioning robot was created in 1738 by Jacques de Vaucanson , who made an android that played the flute, as well as a mechanical duck that reportedly ate and defecated. In 1893, George Moor  created a steam man. He was powered by a 0.5 hp gas fired boiler and reached a speed of 9 mph (14 kph). Westinghouse made a humanoid robot known as Electro. It was exhibited at the 1939 and 1940 World’s Fairs, whereas the first electronic autonomous robots were created by Grey Walter at Bristol University, England, in 1948. If, however, we want to look for the origin of robots as a technical-tecnological category we ought to mention the Tesla's* patent and experiment in Madison Square Garden in New York in 1898 in which he demonstrated radio control of a ship. That was in fact the first remotely controlled object, i.e. robot in a wider sense of the term. If we would like to relate the beginnings of robotics to the appearance of industrial robots we should point out that George Devol patented in the United States a first robotic device in 1954, whereas Joseph Engelberger, also an American, constructed first industrial robot in 1961. Therefore, the year 1961 was essential for the beginning of industrial robotics. Since 1970 we have witnessed an intensive development of industrial robotics. Robots have replaced men primarily in those jobs that were dangerous to humans and harmful to their health, and also introduced higher regularity and accuracy in machining of parts, assembly of blocks and systems, as well yielded increased productivity. For example, in the last 15-20 years car manufacturing has been automated and fully robotized, starting from the initial stage of forging, through engine manufacture, to assembly of parts into the final product – car, including its painting. In addition to industrial robots whose number is presently estimated to one million, one third of them being made in Japan, in the last decade we have witnessed a rapid development of robots of special dedication. These are, for example, robots for antiterroristic actions, for deactivating explosive devices, locating and destroying mines, mending damages in the electric power network without switching off, picking fruits, concrete works, digging underground channels and their maintenance, cleaning tall buildings, replacement of damaged parts of tanks and pipelines, sheep shearing, robots-butchers for meat carving and deboning, micro-robots for inspection of intestinal tract, and even for examination of the quality of blood vessels, etc. There have been more frequent attempts in which robots performed delicate surgical operations, either on the spot or at a distance. Robotics, therefore, extends the frontiers of its application, whereby robots attain completely new functional structures and forms of construction. Thus, for example, a pilotless aircraft is in fact a robot-aircraft, and automatically-guided tank (vehicle) with controlled fire action on the target, is again a robot of its kind; an automatically-guided torpedo is a submarine robot; a cruise missile is a pilotless aircraft that can not only track the target that should be destroyed, but, relying on artificial intelligence, detect it too. 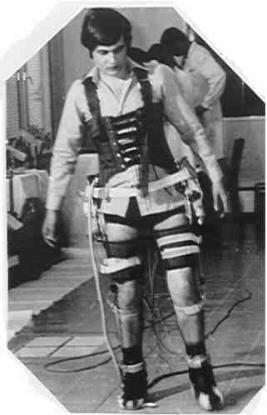 The beginning of the development of humanoid robotics coincided with the beginning of the development of active exoskeletons, first in the world, in 1969 in the Mihajlo Pupin Institute under the guidance of Prof. Vukobratovic, together with his closest associate dr Dragan Hristic who was the head of the construction section [3-7]. It should be noted that legged locomotion systems were developed first. Also, the first theory of these systems has been developed in the same institute, in the frame of active exoskeletons. Hence, it can be said that active exoskeletons were the predecessors of contemporary high-performance humanoid robots (Figures 1-6). Recently, there has been evident revived interest in active exoskeletons, first of all of military dedication . The present-day active exoskeletons are developed as the systems for enhancing human natural skeletal system. Figure 2. First in the world walking active exoskeleton, pneumatically powered and partly kinematically programmed, for producing near-anthropomorphic gait. Made in 1969 at the Mihajlo Pupin Insti­tute, a predecessor of more complex exoskeletons devices for severely handicapped persons. 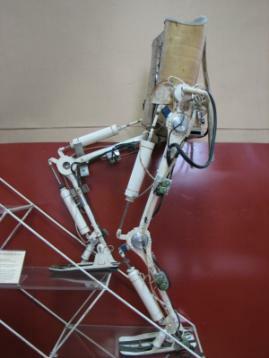 The most successful version of an active exoske­leton for rehabilitation of paraplegics and similar disabled persons, pneumatically powered and electronically programmed, realized and tested at Belgrade Orthopedic Clinic in 1972 is presented in Fig. 3. One specimen was delivered to the Central Institute for Traumatology and Orthopedy in Moscow, in the frame of the USSR-Yugoslav inter-state scientific cooperation. From 1991 the exoskeleton belongs to the basic fund of Polytechnic Museum (Moscow) and State Museum Fund of Russian Federation (Fig. 4). It is displayed in the frame of the Museum's exposition dedicated to the development of automation and cybernetics. 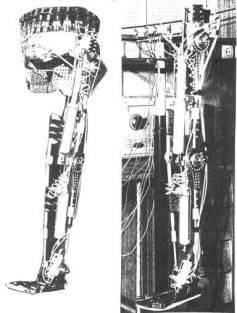 Active exoskeleton with electromecha­nical drives, electronically programmed, built and tested in 1974 is presented in Fig. 3. Served mainly to evaluate and develop electro-mechanical drives for active orthotic devices, as the "active suit" or active arm orthosis. This was the first example known in the world of active exoskeleton that used electric motors as actuators. As such, it can be considered as a predecessor of the contemporary humanoid robots driven by electric motors. Most successful version of active exoske­leton for rehabilitation of paraplegics and similar disabled persons, pneumatically powered and electronically programmed, realized and tested at Belgrade Orthope­dical Clinic in 1972. One example delivered to the Central Institute for Traumatology and Orthopedy, Moscow in the frame of the USSR-Yugoslav inter-state scientific colla-boration. From 1991 the exoskeleton belongs to the basic fund of Polytechnic Museum (Moscow) and State Museum Fund of Russian Federation. It is displayed in the frame of the Museum's exposition dedicated to the development of automation and cybernetics. Figure 4. 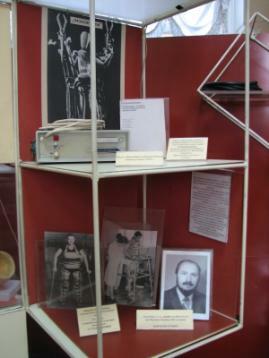 Belgrade active exoskeleton exhibited in the Polytechnical Museum in Moscow as an item of the basic fund of objects. “Active Suit”, a modular semi-soft active orthotic device for dystrophics. Made in 1978, electro-mechanically driven and microcom-puter programmed and controlled. It was successfully used for the purpose of both rehabilitation tests and research purpose. As chance would have it, this was done within the project that was financed by the known US organizations, SRS (Social Rehab. Service) and NSF (National Science Foundation), in the frame of the intensive USA-Yugoslavia scientific cooperation. About this, there are official reports and documents, publications, movie tapes, etc. That was a real sensation and actually the first active exoskeleton in the world. Delivered to the Texas Rehabilitation Center, Houston for evaluation purposes. Figure 6. Successfully developed active arm orthosis for rehabilitation of advanced cases of dystrophy and similar diseases. Controlled by means of a joystick. Made in Mihajlo Pupin Institute in 1982. Forty years ago, at the third All-Union Congress of theoretical and applied mechanics in Moscow in January 1968, and at the first international IFAC Symposium on technical and biological control problems in Yerevan in September of the same year [9, 10], a paper entitled “Contribution to the Synthesis of the Biped Gait” was presented. Authors of the paper didn’t anticipate that a new scientific field was born – dynamics and control of anthropomorphic robots. Inside of the great Moscow Congress Hall, of that January day of 1968, in front of the audience made of well-known scientists from the domain of mechanics in the former Soviet Union and a great number of distinguish foreign visitors, the presented paper produced a great interest and response. Professor Lurie, already a legend in mechanics and world-recognized scientist, a propos the presented paper mentioned among the others that the work, full of rich and new context, constituted, for sure, a new chapter in applied mechanics. Similar success was reiterated several months after, at the already mentioned congress in Yerevan, where the world-recognized scientific elite from the field of control was assembled. Already at the mentioned symposium, probably because of the success of the presented paper, the author was invited to be a member of the international program committee, together with the great names in the domain of the theory of control such as academicians Trapeznikov, Cipkin, Anokhin, Ajserman, Eshbi, Fleming, Weskot, Milsum, Iberal, and others. After being presented at these famous Moscow and Yerevan symposia, the same paper was published under unchanged name in the prestigious American journal IEEE Transaction on Biomedical Engineering, in 1969  as the first published journal paper in the domain of dynamics of active biped anthropomorphic mechanisms. Today, this method is recognized and accepted method in the international scientific community, representing one of the hallmarks of the Belgrade School of Robotics and the method’s author [11, 12]. Let us remind ourselves of that, now so remote, time of the beginning of dynamic and control of artificial movement, especially artificial gait. Namely, to solve the problem of dynamic balance successfully, a specific point at which in some explicit time, the resulting dynamic reaction force influences the system, i.e. a point where there is no moment related to the dynamic reaction force, has to be introduced. In the subsequent papers by Vukobratovic and others in the period 1970 - 1972 [13-16] this point was named Zero Moment Point (ZMP), and under this name has been recognized to the present. Under the notion of ZMP is understood the phenomenon that during the natural human gait, there is a point at the foot-ground contact at which trajectory of zero-moment point is formed, where, in different time sequences, the resulting dynamic reaction of the biped system is acting. If, during the gait, this path of rearrangement of resulting dynamic reaction is more natural, the synthesized gait is more anthropomorphic and natural, i.e. the artificial gait of humanoid robot is more human-like. So, at the very beginning, technical imitation of biped gait was globally based on the biological, human formula. Besides, we understood that dynamic balance during the gait could not be realized without feedback with respect to the contact reaction force, which acts at the contact of the foot and the ground. Over the feedbacks of internal (relative) angles of anthropomorphic mechanism which ensure the desired movement of the extremities and body of the artificial biped system, regular gait of the robot in external coordinates is not possible to be realized without controlling dynamic reaction force at the foot-ground contact, that is without controlling the zero-moment point. An example of this would be the instance of dimmed legs (absence of feeling of dynamic reaction force), when it is practically impossible to establish dynamic balance and regular gait. Finally, a human and his mechanical surrogate – robot, can not maintain dynamic balance during the gait without information about the reaction force and its control. After these postulates of artificial gait synthesis which are established on the basic biological principles of human biodynamic of the gait it is obviously clear that dynamic balance during the gait can be established by measurement of deviation of the real zero-moment point from the desired (programmed) one, where, under ideal circumstances, the resulting dynamic reaction force acts during the contact of the foot with the ground, and there is no external moments that would act as a perturbation disturbance and cause the system’s falling down. Based on the measurement of previous deviation of the real zero-moment point from its planned (programmed) path, correction movements are calculated which should reduce, i.e. minimize the difference between the real and ideal position of the ZMP, and thus ensure the system’s dynamic balance during the gait. In parallel with the states feedback including loads feedback at powered joints of legged locomotion robots and particularly of biped mechanisms, it is essential for dynamic balance of the overall system to control ground reaction forces arising at the contacts of the feet and the ground. For instance, with the biped robot in the single support phase, shown in Figure 7, it is possible to replace all elementary vertical forces by their resultant. Let that point (Fig. 7) in the Cartesian frame be the point where the resultant ground reaction force is acting (axes x and y being horizontal and z-axis vertical), then a mathematical expression for achievement of dynamic balance is: and . It is not necessary for the moment about z-axis to be zero, provided it is compensated for by the friction between the foot and ground. Thus, does not cause motion. The point (Fig. 7) inside the support area (excluding the edges) is termed Zero-Moment Point (ZMP). The equations of dynamic equilibrium of the biped mechanism can be derived for ZMP, so that the introduction of the ZMP notion [9, 10, 13-16] made it possible solve this very specific problem of applied mechanics. Namely, for any other point except for ZMP, equations of dynamic balance would contain unknown dynamic reaction forces, making thus the problem of dynamics modeling in the class of legged, particularly of biped locomotion robots, unsolvable. However, if we integrate the equations written for the ZMP, then it becomes possible to calculate the reaction forces, as they depend on all internal coordinates, velocities, and accelerations of the overall mechanism. A next decisive step in modeling and control of legged, particularly biped locomotion robots, was the introduction of the semi-inverse method [14-15]. What is the essence of the semi-inverse method? The conditions of dynamic equilibrium with respect to the coordinate frame attached to the ZMP give three relations between the generalized coordinates and their derivatives. As the whole system has n degrees of freedom (n>3), the trajectories of the (n-3) coordinates can be prescribed so as to ensure dynamic balance of the overall system (the trunk motion including the arms if the biped robot is in question). If there be some supplementary ZMPs (like passive joints of the biped arms), then for every additional ZMP another three equilibrium conditions are available. As we can see, semi-inverse method is a direct implication of ZMP. Using the ZMP method and initial conditions of the humanoid system, with the semi-inverse method we can calculate complete system state, having dynamic balance of the humanoid system ensured. Thus, when applied to the problem of investigating dynamics of biped systems, the motion of the links is partly known, while the unknown moments are equal zero. Vanishing of the given moment results from the equilibrium conditions about the supporting point (ZMP) and about the joints of passive links. ZMP and projected center of gravity. Using ZMP concept, the researchers in the Kato Laboratory elaborated three-dimensional graphics of a walking robot (Fig. 9) in 1984. 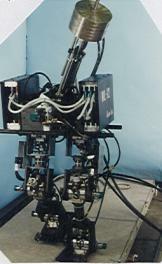 This system enabled the analysis of ZMP in the course of biped robot's walking, and the composition of a walking pattern combined with the robot’s actuators' characteristics on three-dimensional graphics (Fig. 9). The ZMP concept and semi-inverse method were elaborated in the further research [3, 16]. Ichiro Kato and his associates were the first who realized dynamic walking compensation with the body (Fig. 10, WL-12, 1986). A walking bipedal robot must be able to set its own gait so as to be capable of adapting to rough terrain, or avoiding obstacles. So these researchers developed the WL-12 with a body that stabilized its own gait. 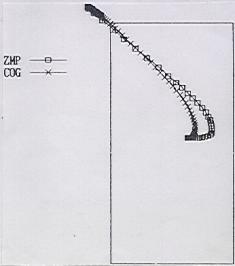 The WL-12 was capable of performing 30-cm steps in 2.6 s, using a newly proposed algorithm that automatically composed the time trajectory of the body while arbitrarily giving the trajectory of the lower limbs and ZMP. Based on the same ZMP method, the authors from Honda R & D Co. Ltd. Wako Research Center have presented [17-18] the HONDA Humanoid Robot (Fig. 11.) – the most successful result in biped locomotion to date. Among many research activities in the domain of humanoid robots (modeling and control) it should be emphasized the importance of a big and very promising project on Virtual Humanoid Robot Platform . Recursive formulation of robot dynamics was presented in 1973 by Vukobratovic , who also gave a complete recursive Newton-Euler formulation in robot modeling, along with the application of this computation method onto open-link manipulator mechanisms. To expand this, Vukobratovic and Potkonjak derived the first recursive Lagrangian formulation in robot modeling . The method has been dedicated to the direct and inverse problems of dynamics. The method of Appel’s equations, conceived by E. P. Popov , was developed in its final form by Vukobratovic and Potkonjak , to solve both the inverse and direct dynamics problems. Computer-aided generation of robot dynamics in symbolic form has been developed in the Mihajlo Pupin Institute under the guidance of M. Vukobratovic. At the time of the beginnings of numerical procedures, their computational deficiencies were an obstacle to the application in on-line controllers. The same was true of the numeric-kinematic algorithm. However, symbolic approaches to deriving robotic models can be much more efficient than the numerical ones. A symbolic method exploits in full the particular kinematic and dynamic structures of the manipulator. These “customized” algorithms eliminate the unnecessary arithmetic operations. The advantages of customized symbolic methods in robotics were recognized first in [25-26] and an effective method of modeling serial-link manipulators in numeric-symbolic form was elaborated in . Dynamic approach to generating robotic trajectories is the method for an optimal synthesis of manipulation robot trajectories. It was proposed in 1982 , whereby the system was considered as a complete, nonlinear dynamic model of the mechanism and actuators . Regarding the practical importance of the energy for optimal motion synthesis, ensuring simultaneously a smooth, jerkless motion and minimal actuators’ strains, a particular attention was paid to the energy needed for an optimal motion of nonredundant manipulators. A procedure for the dynamic synthesis of redundant manipulator trajectories  was proposed for the first time in 1984. This procedure was not really dynamic for the reason that the system was presented by a kinematic model, but the optimality criterion was a dynamic one. This method exhibited considerable advantages over the kinematic approaches in the cases of manipulation of heavy objects by large, powerful robots, and high-speed manipulation with high-energy consumption. The centralized feed-forward control is one of the dynamic control laws which has been effectively used in practice. It includes the so-called nominal programmed control, which compensates for the dynamics of the overall mechanism along the nominal trajectory. The centralized feed-forward for the application in biped locomotion systems was proposed in the early papers [10, 13, 15]. With the biped walking machines, an accurate tracking of the pre-calculated nominal trajectories, achievable by applying the centralized feed-forward control, was a prerequisite for ensuring dynamic equilibrium during the walk. The centralized feed-forward control to manipulation robots was introduced by Vukobratovic and Stokic [31-33]. As compared to other dynamic control laws (e.g. the so-called inverse dynamics or computed torque method) [34-36], the centralized feed-forward has exhibited considerable advantages such as higher robustness, simpler control scheme, requiring no changes in the basic structure of the classical servo-system schemes, etc. The application of centralized feed-forward in the commercial industrial robot controllers that showed full effectiveness of the proposed approach, has begun a number of years later. Optimal feed-forward control speeds up the motion of mechatronic systems near to the physical limits. In the recent applications, real-time optimal feed-forward control enhanced the international competitiveness of the leading robot manufacturers. Also, the robot-in-the-loop mathematical optimization reduced drastically the time needed for robot controller tuning. The first idea of applying dynamic control to robots originated from the goal to track a prescribed trajectory by the anthropomorphic active mechanisms, specifically biped locomotion systems. In the papers [9, 10] it is suggested a dynamic control scheme consisting of a feed-forward path (based on the complete dynamic model of the system) and feedback path, where the role of the feed-forward compensation is to cancel the nonlinearities of the nominal dynamics of the system. Several years later, such approach was proposed and elaborated for the joint space dynamic control of manipulation robots [31, 32, 37]. When a decentralized controller is applied to an active spatial mechanism, the system is considered as a set of subsystems. In order to compensate for the influence of dynamic coupling among the subsystems, a two-stage synthesis of control was introduced [10, 15, 31, 38]. This approach was applied first to biped locomotion systems, and was extended later to manipulation systems and other active mechanisms . First, the so-called nominal programmed control is applied, realizing the desired motion of the system in an ideal case for some specific initial conditions. In the second stage of control synthesis, the control to stabilize the system around the nominal trajectory under the perturbations of the initial conditions, has to be synthesized. By introducing the programmed nominal control, the dynamic coupling among the subsystems is thus reduced, assuming that we consider the system state in the finite regions of state space. To further compensate for the influence of strong coupling, the following approach was proposed : if each mechanical degree of freedom is considered as a subsystem, the coupling among such subsystems represents a force (torque) which could be either computed using the dynamic model of the mechanism, or directly measured. This enables the introduction of the so-called global control in the form of feedback via either computed torque/force or direct torque/force feedback. By applying such a global control, the destabilizing influence of the coupling upon the global system stability can be minimized [31, 39]. A similar approach can be applied if a decentralized observer is applied for a strongly coupled active mechanism . The application of the force feedback for the biped locomotion systems has been proposed for the first time by Vukobratovic and Stokic [15, 38, 39]. The effects of joint force sensory feedback to compensate for the dynamic coupling among the joints of the articulated mechanisms, has been first recognized with the biped locomotion robots, since the coupling among the joints motion is very strong and has a major influence upon the overall system stability. Another advantage of this approach over the dynamic control laws based on the dynamic models of robots is that the force feedback compensation is not sensitive to the inaccuracy in the identification of the model nonlinearities and parameters. In the papers by Vukobratovic and Stokic [15, 31, 39, 40], the application of the decentralized control to large-scale mechanical systems in the domain of robotics has been considered for the first time from a theoretical point of view. Local control is synthesized for each subsystem, neglecting the interconnections among them. Since the influence of interconnections between the subsystems may be too strong, nominal programmed control calculated using a centralized model of the system has been introduced [31-33, 39]. However, this approach is acceptable when the desired motion is well known in advance and when the system parameters are precisely defined. If these assumptions are not met, then the synthesis and application of the nominal programmed control based upon the complete, centralized model is not appropriate. For these reasons a completely decentralized control law has been proposed [41-43]. This control law includes local servos around the joints and the local nominal feed-forward terms based on the decentralized model of the robot dynamics. This decentralized control approach has been used with industrial robots for a long time (normally without local feed-forward terms), but no theoretical analysis of such control scheme has been carried out. The appearance of unpowered degrees of freedom is most characteristic of legged, particularly bipedal, locomotion robots. Namely, during the real walking under perturbations, additional angles appear causing that the whole robot rotates around its feet edges. These passive (unpowered) degrees of freedom have a prevailing influence on the overall biped robot stability. Differing from the so-called underactuated systems that appear in the today's papers, in which the problems of control and stability are of academic character, the mentioned types of robotic mechanisms inevitably involve supplementary degrees of freedom which, by their nature, are really unpowered (passive). The presence of unpowered joints highly complicates the stability investigation of such robotic mechanisms [31-33, 42-44]. One of the main problems in the synthesis of control laws for robots represents the uncertainties in the robot dynamics models. The uncertainties in the dynamic model of the environment in different technological tasks may especially have high influence, because of the difficulties in the identification/prediction of the parameters of the environment and its behavior. Therefore, it is of major importance to test the robustness of the synthesized control laws with respect to these model uncertainties. The practical stability of a robot around the desired position trajectories (and force trajectories in the case of the so-called constrained motion tasks) are defined by specifying the finite regions around the desired position (and force trajectories) within which the actual robot's position coordinates and velocities (and forces) have to be during the task execution [31-33]. The unified position-force control differs essentially from the above conventional hybrid control schemes. Vukobratovic and Ekalo [42-44] have established a dynamic approach to control simultaneously both the position and force in an environment with completely dynamic reactions. The approach of dynamic interaction control [42-44] defines two control subtasks responsible for the stabilization of robot position and interaction force. The both control subtasks utilize dynamic model of the robot and environment  in order to ensure tracking of both the nominal motion and force. Instead of the established traditional hybrid position/force control, a new approach was proposed, which for the first time involved dynamic environment in the dynamic control of the whole robot-environment system [42-44]. However, the model uncertainties, representing a crucial problem in control of robot interacting with a dynamic environment, have not been yet addressed appropriately. The inaccuracies of the robot and environment dynamic models, as well as the robustness of dynamic control have been considered in [46-49]. As it is mentioned in the introduction, the rapid development of humanoid robots shifts anew the boundaries of Robotics as a scientific and technological discipline. New technologies of components, sensors, microcomputers, as well as new materials, have recently removed the obstacles to real-time integrated control of some very complex dynamic systems like the modern humanoid robots, which already today possess about sixty degrees of freedom and are updated in microseconds of the controller signals. In view of the above statements, this article raises the essential question of the justification of increasing the number of degrees of freedom of humanoid robots, having in mind that for the overall skeletal activity the man has at the disposal roughly more than 700 muscles, which could be approximated by more than 350 equivalent degrees of freedom, i.e. the same number of biological actuators. The most recent knowledge from anatomy indicates that certain groups of muscles are responsible for dynamic movements of the particular body parts (shoulder, hip, backbone), encompassing complex translations and rotations at a joint. Hence, humanoid systems are presently modeled using the so-called synovial joints, bearing in mind that a synovial joint has more than 3 degrees of freedom (rotational and translational). Human joints have dynamics which is qualitatively different from that of robotic joints, as human joints are more flexible than the robotic ones. Each human joint, in addition to dominant rotations (like with robots), possesses a small dose of concealed translations. From a point of view of mechanics, the link of the human hand or leg is not a rigid body fixed at a point – as is with contemporary robots, but a rigid body flexibly connected by short cords (ligaments). The above obstacles being removed, along with the humanoid robots playing mainly the role of communicators and entertainers, there appear humanoids of quite different aspirations in the domain of manipulation-locomotion activities of humans (case of sports-man on a trampoline, man on the mobile dynamic platform, running, balanced motion on the foot - a karate kick, playing tennis, soccer or volleyball, gymnastics on the floor or using some gymnastic apparatus, skiing – balanced motion with sliding, etc.). It is interesting to notice that the very beginnings of robotics in a historical sense are related to constructing artificial doubles of man or of animals that exist in nature. Although the beginning of the development of robotics is usually related to the appearance of industrial robots, this can be considered only as a short break between historical attempts in making human’s mechanical double and the present-day development of humanoid robotics and active exoskeletal systems. Presently, industrial robotics is apparently in stagnation, whereas humanoid robotics is experiencing its rapid development and, we can say, enters the phase of its renaissance. Robotics, therefore, extends the frontiers of its application, whereby robots attain completely new functional structures and forms of construction. However, this is not the end. If a building is capable of controlling its deviation from the vertical position, i.e. oscillations caused by strong wind blow, as well as in the circumstances of seismic soil acceleration, such a construction can be thought of as a specific, i.e. unconventional, robot or active system. Figure 12. “BLEEX”  Project is financed by DARPA It can load up to 32 kg. Man has feeling like 2 kg is on his back. The aim is to improve load up to 60 kg with feeling like 4 kg. Figure 13. HAL-5  is a robot suit which can expand and improve physical capabilities of human being. Developed at the University of Tsukuba under the guidance of professor Sankai. By wearing HAL-5, you can hold up to 40 kg load by arms and can increase the maximum weight of leg press from 100 kg to 180 kg. A special class of robots makes humanoid robots. There have already been numerous attempts, especially in Japan, to employ them as assistants in the human living and working environment. It is believed that in the decades to come they will find wide application in co-operation with man as service robots. Of course, a prerequisite would be some new norms of adapting appropriately the living environment, including furniture and various appliances. A special characteristic of these robots is their anthropomorphic appearance and involvement of elements of artificial intelligence. An idea about humanoid robots was actually born as an intention to help to handicapped persons which has no capability of movement. By definition, rehabilitation exoskeletons should also be of anthropomorphic shape. Such robots, first in the world, were realized at the beginning of the eighth decade of the last century in the Mihajlo Pupin Institute in Belgrade (Figure 5). 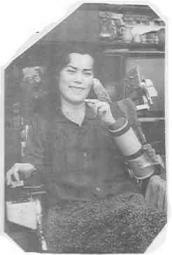 It was the first example of an exoskeleton for anthropomorphic motion of handicapped persons of paraplegic type. The group of Academician Vukobratovic has also constructed first in the world arm orthosis (Figure 7). The success of functionality was proved by the society of dystrophies in Belgrade. Today we are the witnesses of the renaissance of this type of robotics, especially for military purpose. Several successful projects in the world from which we will mention project “SARKOS” at the university of Utah (USA) under the guidance of professor Stefan Jacobsen, then project “BLEEX”  from Berkeley (Figure 12) under the guidance of professor Kazerooni and financed by the DAPRA, as well as the project “HAL-5”  from the university of Tsukuba (Japan) (Figure 13) under the guidance of professor Sankai. All these projects have for the main goal an increasing of human mechanical possibilities. Although this was exactly the starting point in our research in this domain, we are witnessing the intentional or “accidental” neglecting of our achievements and pioneering results by a small number of researchers. This neglecting, as a product of the great time line from our first research results is indirectly a sideway recognition to us for our providence in the field. Presently, we are witnessing a rapid development in the domain of humanoid robots and active exoskeletal systems. Their mechanical complexity and capabilities considerably converge to those of humans. The beginning of the development of humanoid robotics coincided with the beginning of the development of the world’s first active exoskeletons at the Mihajlo Pupin Institute in 1969, under the guidance of Prof. Vukobratovic. It should be noted that legged locomotion systems were developed first. Also, the first theory of these systems was developed in the same institute, in the frame of the work on active exoskeletons. Hence, it can be said that active exoskeletons (Figs. 4-5) were the predecessors of the modern high-performance humanoid robots. Recently, there has been evident a revived interest in active exoskeletons, first of all of military dedication . The present-day active exoskeletons are developed as the systems for enhancing power and expanding physical and working capabilities of man. However, the beginnings of robotics, and especially of humanoid robotics, did not foreshadow such a development . Here, we wanted to take a look back on the beginnings of the development of humanoid robots, especially bipedal locomotion systems and active exoskeletons, whose development marked the beginning of the research in the domain of humanoid robotics. For the sake of truth, in the first stage of our work on two-legged locomotion we deeply believed that the synthesis and control of anthropomorphic gait could have their practical application only in the domain of active exoskeletons for severely handicapped persons of paraplegic type. Because of that, already in the far 1968 we started with a very simplified exoskeleton, which was completed in the Mihajlo Pupin Institute during the next year. 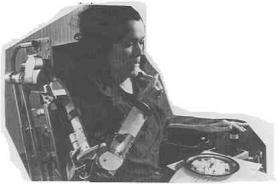 In 1972 we completed an intrinsically extended version of the pneumatically driven exoskeleton aimed at restoring the basic locomotory activities of the paraplegics, and this event, naturally, evoked favorable responses in the world. In the beginning of our work on the theory and application of anthropomorphic mechanisms nobody could envisage such an intensive development in the field of humanoid robotics. On the other hand, such a state of humanoid robotics, heralding its future advancements, represents to me and my associates and followers a real scientific and professional satisfaction as we can see that our theoretical results have become and, several decades since their appearance, have still remained a sound basis for the dynamic control of humanoid robots. The above results, representing pioneering contributions to the theoretical analysis in robotics, have been valued by some of the most prominent world experts such as, for example, Prof. G. Hirzinger, Director of DLR Institute for Robotics and System Dynamics in Wessling, Germany, who says: “Prof, Vukobratovic is for me one of the real pioneers in robotics. He was one of the first in the world to realize the importance of dynamics, even at a time where nobody working in robot industry could believe that robots might ever be something else than purely position-controlled machine on joint level. We are now indeed entering an area where industrial robots start to take into account the dynamics. Prof. Vukobratovic predicated this many years ago . Given the present level of technology, the question is posed: Are we ready to move towards personal robotics, and what might be the first step? A possible answer to this question might be given through the analysis of the human-like characteristics a personal robot must possess: human-like motion, human-like intelligence, and human-like communication. Such a challenging goal requires coordinated and integrated research efforts that span over a wide range of disciplines such as system theory, control theory, artificial intelligence, material science, mechanics, and even biomechanics and neuroscience. Thus, the research is risky, but the target is challenging and promising. At the end we have to note that this paper did not collect the full opus in the domain of dynamics and dynamic control of humanoid systems. Only a small part is mentioned regarding the development of the dynamic control related to active exoskeletons which also fended for the applicability to humanoid robotics and robotics in general. We hope that in the near future, some papers, written in cooperation especially with Russian scientists, wile provide a wider analysis, casts and new results, and outline some new frontiers in dynamics, especially applicable to humanoid robotics. “Belgrade School of Robotics”, Monograph, Publisher: Mihailo Pupin Institute, Belgrade, Editor M. Vukobratovic, Printed by “Kuca Knjige”, Belgrade 2001. Mark E. Rosheim, Robotic Evolution – The Development of Anthrobotics, John Wiley & Sons, Inc, 1994 ISBN 0-471-02622-0. Vukobratovic M., Hristic D., Stojiljkovic Z., "Development of Active Anthropomorphic Exoskeletons", Medical and Biological Engineering, Vol. 12, No 1, 1974. Vukobratovic M., Legged Locomotion Robots and Anthropomorphic Mechanisms (in English), research monograph, Mihailo Pupin Institute, Belgrade, 1975, also published in Japanese, Nikkan Shumun Ltd. Tokyo, 1975, in Russian "MIR", Moscow, 1976, in Chinese, Beijing, 1983. Hristic D., Vukobratovic M., “Active Exoskeletons Future Rehabilitation Aids for Severely Handicapped Persons”, Orthopedie Technique, 12/1976, pp 221-224, Stuttgart, Germany. Vukobratovic M., Borovac B., Surla D., Stokic D., Scientific Fundamentals of Robotics, Vol. 7, Biped Locomotion: Dynamics, Stability, Control and Application, Springer-Verlag 1989. Vukobratovic M., Borovac B., Stokic D., Surdilovic D., Active Exoskeleton, Ch. 27: Humanoid Robots, pp 727-777, Mechanical Systems Design Handbook: Modeling, Measure and Control, CRC Press, 2001.
 http://bleex.me.berkeley.edu/bleex.htm, Bleex hompage, active exoskeleton project under the guicance of prof. H. Kazerooni. Vukobratovic M., Juricic D., “A Contribution to the Synthesis of Biped Gait", IFAC Symp. Technical and Biological Problem of Control, Yerevan, USSR, 1968. Vukobratovic M., Juricic D., “Contribution to the Synthesis of Biped Gait", IEEE Trans. on Biomedical Engineering, Vol. 16, No 1, 1969.
 http://en.wikipedia.org/wiki/Zero_Moment_Point home page of wikipedia about Zero Moment Point and her inventor Miomir Vukobratovic. http://encyclopedia.topliterature.com/?title=Humanoid_robot home page of encyclopedia “Top Literature” about the history line of humanoid robotics and Zero Moment Point. Vukobratovic M., Legged Locomotion and Anthropomorphic Mechanisms, monograph Mihailo Pupin Institute, Belgrade, 1975. Juricic D., Vukobratovic M., “Mathematical Modeling of a Bipedal Walking System", ASME publication 72-WA/BHF-13, Winter Annual Meeting, New York, Nov. 26-30, 1972. Vukobratovic M. "How to Control Artificial Anthropomorphic Systems", IEEE Trans. on Systems, Man and Cybernetics, Vol. SMC-3, Sept. 1973. Vukobratovic M., Stokic D., “Dynamic Stability of Unstable Legged Locomotion Systems”, Mathematical Biosciences, Vol. 24, No. 1/2, 1975. Hirose M., Takenaka T., Gomi H., Ozawa N., "Honda Humanoid Robot (in Japanese), Journal of the Robotic Society of Japan, Vol. 15, No 1, pp. 983-987, 1997. Hirai K., Hirose M., Haikawa Y., Takenaka T., "The Development of Honda Humanoid Robot", Proc. of the IEEE Intern. Conference on Robotics and Automation, Leuven, Belgium, pp. 1321-1326, 1998. 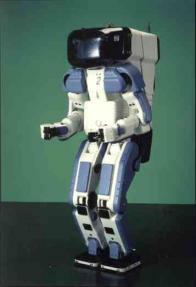 Nakamura Y. et al., "Virtual Humanoid Robot Platform", Proceedings of Humanoids' 2000, Tokyo, 2000. Vukobratovic M., Borovac B., "Zero - Moment Point - Thirty Five Years of Its Life” Intern. Journal of Humanoid Robotics, Vol. 1, No. 1, pp. 157-173, 2004. Vukobratovic M., Stepanenko Y., “Mathematical Models of General Anthropomorphic Systems”, Mathematical Biosciences, Vol.17, pp. 191-242, 1973. Vukobratovic M., Potkonjak V., “Contribution to Computer Forming of Active Chain Models via Lagrangian Form", ASME Journal of Applied Mechanics, No. 1, 1979. Popov E.P., “Control of Robots - Manipulators” (in Russian), Journal of Technical Cybernetics, No. 6, Moscow, 1974. Vukobratovic M., Potkonjak V., “Two New Methods for Computer Forming of Dynamic Equations of Active Mechanisms", Journal of Mechanism and Machine Theory, Vol. 14, No. 3, 1979. Vukobratovic M., Kircanski N., “Computer-Aided Procedure of Forming of Robot Motion Equations in Analytical Forms”, Proc. VI IFTOMM Congress, New Delhi, pp. 965-973, 1983. Aldon M.J., Liegeois A., “Computational Aspects in Robot Dynamics Modelling”, Proc. of Advanced Software in Robotics, Elsevier Science Publishers B.V., Liege, Belgium, May 4-6, pp. 3-14, 1983. Vukobratovic M., Kircanski M., “A Method for Optimal Synthesis of Manipulation Robot Trajectories", Trans. on ASME, Journal of Dynamic Systems, Measurement and Control, Vol. 104, No 2, pp. 188-193, 1982. Vukobratovic M., Kircanski M., “A Dynamic Approach to Nominal Trajectory Synthesis for Redundant Manipulators", IEEE Trans. on Systems, Man and Cybernetics, Vol. 14, No. 4, 1984. Vukobratovic M., Stokic D., “Contribution to the Decoupled Control of Large-Scale Mechanical Systems", IFAC Automatica, Vol. 16, No. 1, 1980. Vukobratovic M., Stokic D., “One Engineering Concept of Dynamic Control of Manipulators", Trans. ASME Journal of Dynamics Systems, Measurement and Control, Vol. 102, June, 1981. Vukobratovic M., Stokic D., Control of Manipulation Robots: Theory and Application, Springer-Verlag, Berlin, 1982. Paul C., “Modeling, Trajectory Calculation and Servoing of a Computer Controlled Arm", A. I. Memo 177, Stanford Artificial Intelligence Laboratory, Stanford University, September, 1972. Bejczy A., "Robot Arm Dynamics and Control", Technical Memorandum 33-669, JPL, February, 1974. Pavlov V., Timofeyev A., "Calculation and Stabilization of Programmed Motion of a Moving Robot-Manipulator", (in Russian) Tekhnicheskaya Kibernetika, No. 6., pp. 91-101, 1976. Vukobratovic M., Stokic D., Hristic D., “Dynamic Control of Anthropomorphic Manipulators”, Proc. 4th Int. Symp. Industrial Robots, pp. 229-238, Tokyo, Nov. 1974. Vukobratovic M., Stokic D., Gluhajic N., Hristic D., “One Method of Control for Large-Scale Humanoid Systems”, Mathematical Biosciences, Vol. 36, No. 3/4, pp. 175-198, 1977. Vukobratovic M., Stokic D., “Simplified Control Procedure of Strongly Coupled Complex Non-linear Mechanical Systems”, (in Russian), Avtomatika and Telemekhanika, also in English, Automatics and Remote Control, Vol. 39, No. 11, 1978. Stokic D., Vukobratovic M., “Decentralized Regulator and Observer for a Class of Large Scale Non-linear Mechanical Systems”, Large Scale Systems, Vol. 5, pp. 189-206, 1983. Stokic D., Vukobratovic M., “Dynamic Stabilization of Biped Posture”, Mathematical Biosciences, Vol. 44, No. 2, pp. 79-98, 1979. Vukobratovic M., Stokic D., “Choice of Decoupled Control Law of Large-Scale Systems”, 2nd IFAC Symp. on Large-Scale Systems, Toulouse, 1980. Vukobratovic M., Stokic D., Kircanski N, Non-adaptive and Adaptive Control of Manipulation Robots, Springer-Verlag, Berlin, 1985. Stokic D., Vukobratovic M., "Practical Stabilization of Robotic Systems by Decentralized Control", Automatika, Vol. 20, No 3. 1984. Vukobratovic M., Stokic D., “Sub-optimal Synthesis of a Robust Decentralized Control of Large-Scale Mechanical Systems”, IFAC Automatica, Vol. 20, No. 6, pp. 803-807, 1984. Vukobratovic M., Ekalo Y., “Unified Approach to Control Laws Synthesis for Robotic Manipulators in Contact with Dynamic Environment”, Tutorial S5: Force and Contact Control in Robotic Systems, IEEE Int. Conf. on Robotics and Automation, pp. 213-229, Atlanta, 1993. Vukobratovic M., Ekalo Y., “New Approach to Control Manipulators Interacting with Dynamic Environment, Robotica, Vol. 14, pp.31-39,1996. De Luca A., Manes C., "Modeling of Robots in Contact with a Dynamic Environment", IEEE Trans. on Robotics and Automation, Vol. 10, No 4, 1994. Ekalo Y., Vukobratovic M., “Robust and Adaptive Position/Force Stabilization Conditions of Robotic Manipulators in Contact Tasks”, Robotica, Vol. 11, pp. 373-386, 1993. Ekalo Y., Vukobratovic M., “Adaptive Stabilization of Motion and Forces in Contact Tasks for Robotic Manipulators with Non-Stationary Dynamics”, International Journal of Robotics and Automation, Vol. 9, Issue 3, pp. 91-98, 1994. Ekalo Y., Vukobratovic M., “Quality of Stabilization of Robot Interacting with Dynamic Environment”, Journal of Intelligent and Robotic Systems, Vol. 14, pp. 155-179, 1995.
 http://www.cyberdyne.jp/English/index.html HAL-5 homepage, active exoskeleton project under the guidance of prof. Sankai. Vukobratovic M., “When Where Active Exoskeletons Actually Born”, International Journal of Humanoid Robotics, Vol. 4, No. 3. pp 459-487, 2007. * Nikola Tesla (1856-1943), famous American scientist of Serbian origin.